Lots of politicking and taxpayer subsidies led up to the ribbon-cutting for the new Walmart in Pullman. 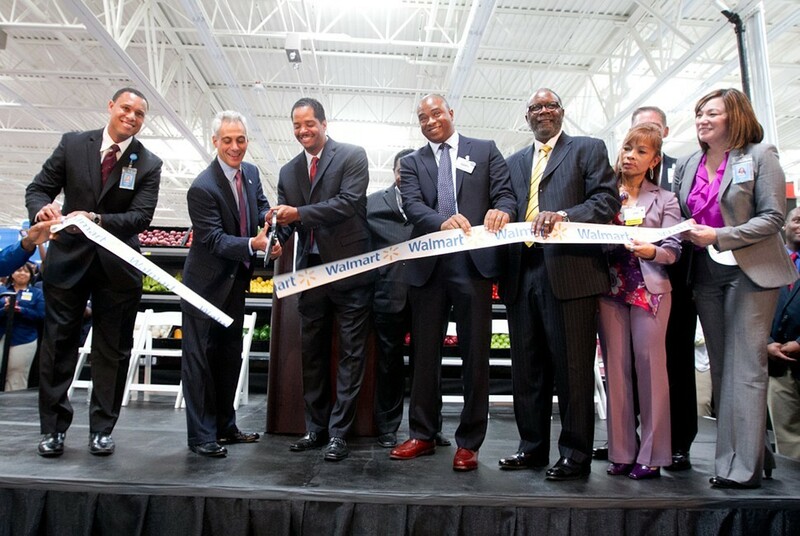 Officially it was a ribbon cutting, but the ceremony on Tuesday for the opening of Chicago's newest Walmart looked and felt more like a homecoming pep rally merged with a revival meeting—if such things were held inside shiny big-box stores plastered with corporate logos. A marching band ripped through anthems like Gary Glitter's "Rock and Roll" ("Da-dadda-dadda-da, hey!"). There were group cheers and sing-alongs. Preachers did a little praying and blessing. Mayor Rahm Emanuel and Alderman Anthony Beale gave speeches to rousing applause. Residents of the Pullman and Roseland community were exchanging hugs and high fives. And there was a consistent refrain throughout: Walmart might be the only thing that can save this distressed, high-crime urban area littered with abandoned industrial sites. At the very least, everyone seemed to agree that it's the best bet right now for Pullman and Roseland. "We are writing a new chapter in Pullman," Emanuel declared. "This is a great day." The message emerged out of years of politics, power plays, and desperation as much as the enthusiasm on display. Previous generations moved to the area for the jobs at big industrial operations like the Pullman train car factory, the Sherwin-Williams plant, or the Ryerson steel processing facility. One by one they all shut down. When Beale took me on a tour of his ward five years ago, we watched bulldozers turn the last of the Ryerson plant into rubble and dust. But the alderman had high hopes for the Ryerson site, near 111th Street right off the Bishop Ford expressway. He and a group of developers wanted to fill it with homes, a community center, and especially new employers of some kind—of any kind, when it came right down to it. Beale initially flirted with various manufacturers, though it became clear that a big-box retailer would be an easier draw. He thought Ikea might be interested. Nothing came of it. He turned to Walmart. The politics were complicated—Beale had expressed distaste for some of the company's labor practices, and he was one of the aldermen who helped pass a big-box living-wage ordinance despite Walmart's threats to bypass Chicago if forced to boost pay and benefits (a threat it's made again recently in Washington, DC). Then Mayor Richard M. Daley vetoed the ordinance, portraying Walmart's expansion in Chicago as a civil rights issue for depressed communities. Most aldermen concluded that they'd rather tout the creation of Walmart jobs than none at all. Beale was among them. In 2007 he announced that a Walmart supercenter would open in Pullman by the following year. It didn't materialize. When the opening was pushed back again and again, Beale lamented that no other companies would take a chance on the site. He repeated that claim at the rally this week: "We went to a lot of retailers and they all turned their backs on us." But lots of deal making and maneuvering were involved, and the full story wasn't quite that simple. In 2010 a number of other retailers—including Target, Costco, and Ikea—told Reader writer Hunter Clauss that no one ever approached them. And Walmart went on to open new stores in nondepressed communities like the West Loop, River North, and Lakeview before getting to Pullman. The new store didn't come for free. More than $37 million in city, state, and federal tax money has been committed to redeveloping the old Ryerson site, including $11 million in tax increment financing funds. That's essentially a subsidy for Walmart, the largest corporation in the world. Over the summer Method, manufacturer of environmentally friendly cleaning products, announced it would follow suit and open a plant behind the Pullman Walmart, with the help of another $8 million in TIF funds. Beale says more businesses are coming. Meanwhile, the Chicago Public Schools closed 50 schools to save money. Two of them were in Roseland. Yet it's undeniable that the area needs jobs and investment. Citywide, nearly 20 percent of African-Americans are unemployed, and officials believe the rate is much higher in Pullman and Roseland. Over the last five years more than 3,000 homes there have gone into foreclosure, leaving some of the residential side streets lined with vacant buildings. The clergy and politicians at the rally hailed Walmart as a savior for employing 400 people and selling fresh food. "Not only is this going to bring jobs, it's going to address the high crime rate in our community, the high obesity rate, [and] the high foreclosure rate," Beale proclaimed. "I want to thank God Almighty." He wasn't the only one full of zeal. Dozens of new employees—mostly young African-Americans, all wearing matching blue shirts and khakis—were literally leading cheers for Walmart. After applying online last spring, Pullman resident Tia Smith said she couldn't believe she was lucky enough to get a call, let alone one of the jobs. A mother of three, she'd been out of work for two years. "I'm so happy I can finally provide for my family," she said. This is the era we live in: officials say taxpayers have to pony up so one of the most powerful businesses on earth will bring low-level retail jobs to the site of a former steel plant. And that's a whole lot better than sinking further.